Speaking of Stacking switches, we have to pay more attention to Cisco’s switches that support stacking. Cisco has a big and powerful family of stacking switches, such as the Cisco 2960X, 3560X, the 3750-X, Cisco 3650, 3850 switches, etc. In this article, we will share some examples of Cisco switch stacking using a couple of Cisco Catalyst 3650. 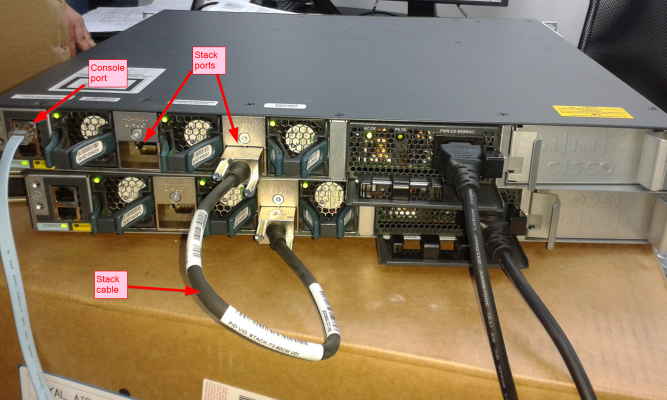 When put in a stack, Cisco Catalyst switches form a single switch. And the stack cabling form what is called a “stack ring”. The stack ring is characterized by its speed. More port density and less trunking: when you run out of switch ports, you need to add another switch. Obviously, you think of connecting it throught a trunk link. This means additional configuration. Instead, putting the new switch in a stack with the old one saves you some time. It’s simply connecting both switches with a stack cable and you have two switches. Ease of management: instead of assigning an IP address to each switch, we assign a single IP address to the stack. high inter-switch bandwidth: getting back to the scenario of adding a switch through a trunk link, the bandwidth you will have between switches depends on the type of interfaces (FastEthernet, GigaEthernet). However, with a stack cable, the inter-switch bandwidth reaches 80G. As we can see from the screenshot, the stack ring speed is 80GB. Two other bits of information are shown: the stack ring configuration and the stack ring protocol. The stack ring configuration shows “Half” because only one stack cable is inserted between the stack members (a switch that is part of a stack is called Stack member). If we had put two stack cables on the Catalyst 3650, the stack ring configuration would have shown “Full”. One simple command to quickly know the status of the stack is the show switch command. What we need to see is “Ready” in the last column. Down: means there is no switch connected to the port, or the switch at the other part of the cable is down. OK: means that the port is up and that there is a switch connected to it. 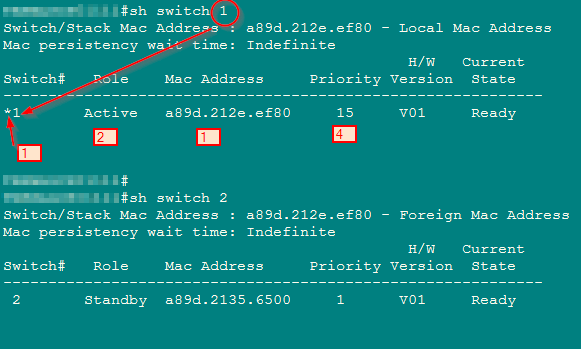 third column: the identifier of the neighbor on Port 2 of the switch. If it says “None”, then there is no switch on this port. 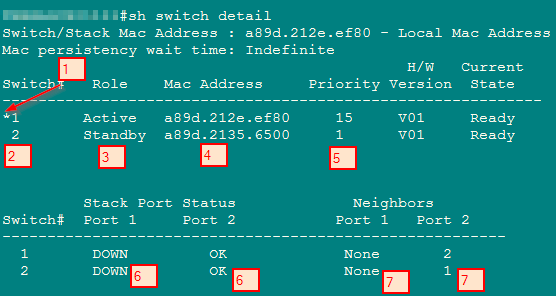 By the way, there is a question raised by users like this: “This is using 4 Cisco 3850 48-port switches. I know that these switches are using latest stacking technology – stackwise-480. How to do the stacking?” What’s your ideas about this? 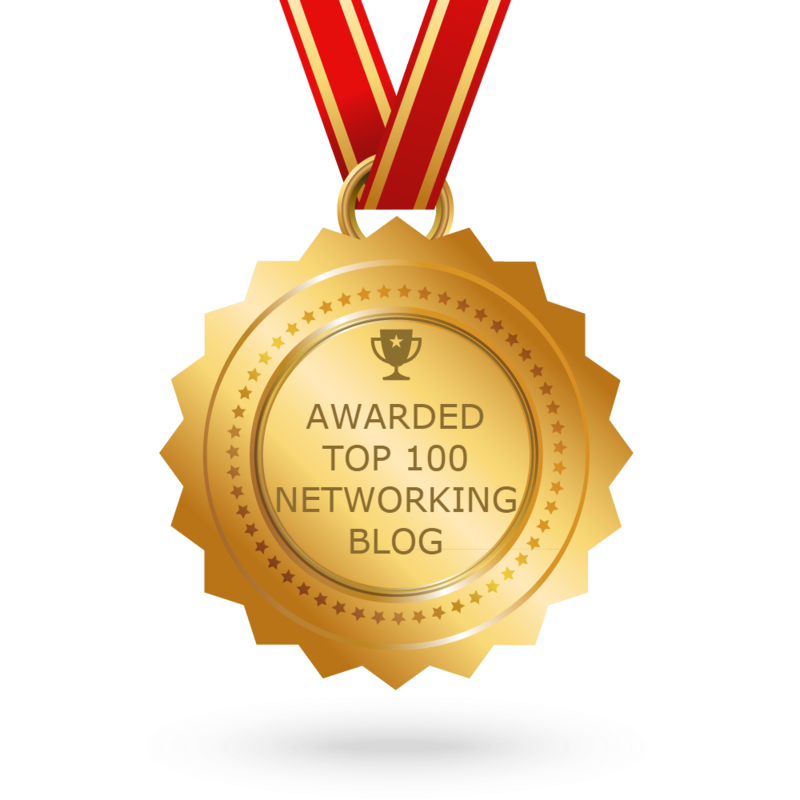 Share with us, please!